All afternoon, Tam and Nina had been gathering firewood in the forest. They had dug so often into the snow that their fingers were numb, but at least their sacks were full. It was dark by the time they trudged back home. Still, the brightness of the house lifted their spirits. They picked up their pace and marched towards the back door. Then they saw the paw prints. The track emerged from the back door, circled around by the garden sheds, then went back into the house. Every print had the shape of four pads, with a groove of claws in between. A wolf! It was their very worst fear come true. For twenty years, the wolf-army had ruled towns and villages, farms and countryside, but had never yet bothered with isolated homesteads on the edge of Eld Forest. Mum and Dad always said their property wasn’t worth the trouble of taxing. So why were the wolves here now? Nina dropped her sack and ran for the back door. Tam dropped his sack and grabbed his sister by the shoulder. Nina nodded agreement. They tiptoed round the side of the house and peeked in through the kitchen window. 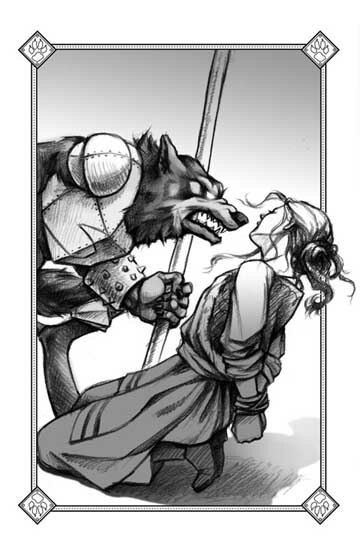 Inside were three huge grey soldier-wolves with iron breastplates. One strutted up and down on his hind legs, throwing open cupboards and searching the shelves. The other two sat at the table guzzling mushroom pie. Mum must have baked it for their dinner. Tam and Nina could almost taste the crisp flaking pastry and smell the beautiful mushroom fragrance. The wolves didn’t bother with knives or forks, but stuck their dark hairy snouts straight into the pie dish. They moved on to the next window, which looked into Nina’s room. A single wolf-soldier sat on her bed surrounded by bits of broken wood and masses of straw stuffing. He had smashed all her furniture and torn her mattress apart. Tam had to drag her away, she was so hypnotised with outrage and horror. They went on to the parlour window at the front of the house. There were five more wolves in the parlour, along with Mum and Dad. One of the wolves bore the bronze insignia of a sergeant on his breastplate; another wore Tam’s red woollen scarf round his neck. Mum and Dad sat in a corner with rope tied round their wrists and their backs against the wall. The sergeant dropped down on all fours and brought his muzzle up close to Dad’s face. He opened his jaws very slowly, then suddenly snapped them shut, like a steel trap going off just an inch from Dad’s nose. Tam nodded. Of course there was no Aunt Emily, but Roddiston was far away on the northern coast. The sergeant brought his muzzle up close to Mum’s face. Saliva dripped from his jaws on to the front of her dress. You could tell she was trying not to gag from the smell of his breath. ‘Yeah, when we torch the place,’ added a third. Swack! The sergeant swung out with a vicious sideways blow. Dad was knocked over, blood spurting from four deep gashes on his face. Too late she clapped a hand over her mouth. Everyone in the room had heard. The wolves swivelled and narrowed their eyes. The sergeant sprang up on his hind legs again. ‘Get ‘em!’ he roared. For a moment, Tam and Nina stood transfixed at the window. The soldiers snatched up their weapons, long pikes with evil barbed points, and headed for the door. Mum launched herself forward headfirst. Her hands were tied, so she turned her body into a projectile. She crashed into the leading soldier and sent him flying. Then Dad rolled across the floor and managed to reach the door. He lay against it and blocked it shut. Wolves struggled to drag him away, but he kicked out like a madman. Mum threw herself into the scrimmage. Tam grabbed Nina’s hand in the same instant that she grabbed his. They turned from the window and fled.